The International Work-to-Live Project is embarking on a five week journey to India to investigate areas of interest for our first project, Pneumoconiosis in India: a Preventable Catastrophe. The team includes myself and the Project's Chief Operations Officer, Jonathan Zuk. I have been aware of a lack of occupational health and safety standards in emerging economies and have been studying related topics for over two years. After working with several American pulmonologists concerning issues of asbestos exposure in the US I have become keenly aware of what educational and awareness programs worked and which ones did not. Scaring people and putting them out of work is not a sustainable way to help people. Earlier this year I started this organization as a way to apply this experience to emerging economies sucha as India, Turkey, and China in the hope that these countries do not have similar experiences. Last month, our organization became officially tax-exempt and hosted our first fundraiser in Northern Virginia. Jonathan and I are touring Northwest India to see where this money might best be spent. 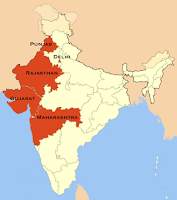 We will be visiting the states of Delhi, Rajasthan, Gujarat, and Maharasthra. Thus far we have scheduled meetings with occupational health professionals in many Indian cities. My goal is to find good people who understand the mission of our organization and can help us carry out it's goals.